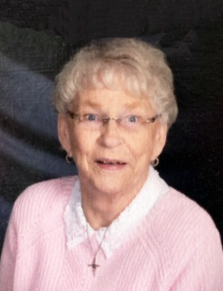 LaVerne Faye Anderson, age 84, Sartell, MN, died Sunday, January 27, 2019 at Woodwinds Hospital, Woodbury, MN. Funeral services will be Thursday, January 31, 2019 at 5:00 PM at Gustavus Adolphus Lutheran Church, Foley, MN. Visitation will be one hour prior to the service at the church on Thursday. Funeral arrangements were made by Benson Funeral Home, St. Cloud, MN. LaVerne was born March 3, 1934 in Sacramento, CA to George and Olga (Johnson) Hesla. She married Ira Lyle Anderson on March 12, 1955 at Zion Lutheran Church, Blackduck, MN. LaVerne was a member of Gustavus Adolphus Lutheran Church, Foley, MN. She enjoyed winters in Arizona, traveling in their RV and flower gardens. Survivors include her children, Jay Anderson of Woodbury, MN; Jean Anderson-Marlatt of Riverton, WY; grandchildren, Remy Marlatt, Olivia Anderson, Sara Anderson. She was preceded in death by her parents, husband Lyle on February 3, 2010, and son, Jeffrey Anderson.